Blogging is a passion and a full-time job for hundreds of thousands of people all over the world. 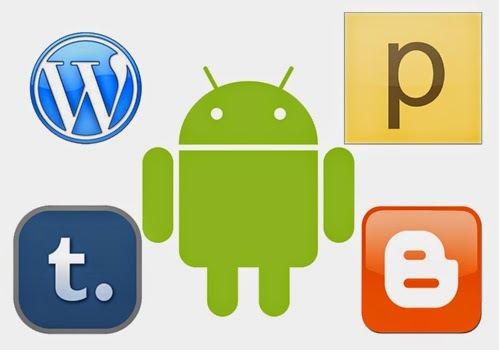 Fortunately, Android and smartphones have made it extremely easy for bloggers to manage and update their blogs. Even if you are on the road, you can still stay connected through your mobile device. There are many amazing apps in Google Play that are ideal for bloggers. They allow you to maintain just about every aspect of your blog without requiring a PC. Here are the top 7 android apps that you can use with your smartphone or tablet. It doesn’t matter how far away you are from your PC, you will still be able to manage your blog or blogs easily and effectively. WordPress is by far the most renowned and widely used blogging platform on the World Wide Web. Ask any serious blogger, they will tell you that most bloggers use WordPress to host their blogs. This particular app can be used for both self-hosted blogs as well as WordPress.com blogs. You can do many important things with this app such as create, edit and publish blog posts. You can even publish videos and photos through this app. You can moderate comments as well. Blogger is another fantastic and one of the most popular blogging platforms out there. If you are using Blogger for blogging, then you must certainly take advantage of this excellent app. You will be able to manage your blog through your smartphone or tablet in a very effective manner. Tumblr is a micro blog that allows you to post quotes, videos, photos and short descriptions and promotions. It’s ideal for those who wish to maintain a simple blog with less but interesting content. Managing this type of blog is easy and fun. Tumblr app for Android gives you the flexibility to share photos, videos and messages quickly and easily. Hootsuite is an amazing app that allows you to manage several social media accounts such as Facebook, Twitter, LinkedIn, and many more. You can use it for free if you want to manage up to 3 social network accounts. Over 9 million users are taking advantage of this app and getting more work done in less time. If you manage a few social network accounts, then you can manage and schedule posts easily through this remarkable app. gAnalytics is a must-have app for bloggers, because it allows you to keep track of your website traffic even when you are away from your PC. It connects to your Google Analytics account and presents the numbers in a very appealing manner. So, next time when you travel, don’t worry about the performance of your website, because you will be able to monitor it all along. Writer is an extremely useful app for bloggers because it will allow you to jot down your ideas immediately. New ideas come and disappear quickly. With this app, you will be able to write down everything that comes to your mind. The best part is that it doesn’t even require an internet connection. If you want to go out to write something new, then you will be able to use this app very effectively. Dictionary.com app allows you to explore the meaning of a word quickly and easily. You will be able to enhance your vocabulary with this app. If English is not your native language, then you will certainly love this app because it will greatly assist you in learning new words every single day. With an amazing variety of Android apps, bloggers can now easily manage their blogs and even social network profiles with a mobile device. Enhance your productivity by using these amazing apps for bloggers. Jenifer is an expert blogger, academic writer and a developer. She develops web and mobile applications; she also provides help to students with their assignments at Assignment Consultant. Find her on Facebook.